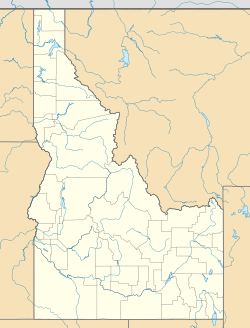 Kootenai / Benewah counties, Idaho, U.S.
Lake Coeur d'Alene ( /ˌkɔːr dəˈleɪn/ KOR də-LAYN) is a dam-controlled lake in northern Idaho, in the northwest United States. Its northern end is in the city of Coeur d'Alene. It spans 25 miles (40 km) in length and ranges from 1 to 3 miles (5 km) wide with over 109 miles (175 km) of shoreline. The lake was named after the Coeur d'Alene people. Lake Coeur d'Alene, like other lakes surrounding the Spokane Valley and Rathdrum Prairie, was formed by the Missoula Floods, most recently 12,000 to 15,000 years ago. The Purcell Lobe of the Cordilleran Ice Sheet flowed south from Canada, carving the basin of present-day Lake Pend Oreille and damming the Clark Fork river. The impounded river repeatedly filled to form Glacial Lake Missoula and broke through the ice dam, resulting in massive floods that filled the Rathdrum Prairie area with sand, gravel, and boulders. Large eddy bars formed downstream from bedrock obstructions, thereby damming tributary valleys and creating lakes. Lake Coeur d'Alene is fed primarily by two rivers, the Coeur d'Alene and the Saint Joe. The outflow is via the Spokane River. The lake's elevation varies from 2,128 feet (649 m) above sea level in the summer to up to 7 feet (2.1 m) lower in the winter, controlled by the Post Falls Dam 9 miles (14 km) below the lake[clarification needed] on the Spokane River. The lake's average surface temperature between June 1 and September 30 is 68 °F (20 °C). The first-recorded European to see the area was explorer David Thompson in 1807. Flooding as a result of the construction and operation of the Post Falls Dam drastically changed the shape and size of the lake, expanding it to combine several smaller lakes into one. The lake has been used for transporting lumber by water in Kootenai County since the timber industry started in the region. Prior to a fire in 1917, Harrison was planned as the county seat of Kootenai County, as the swiftly growing lumber town was at an opportune junction of the St. Joe and Coeur d' Alene rivers. After the fire, the mills were moved mostly to the city of Coeur d'Alene, which developed more and was designated as the county seat. A number of Ford Model T automobiles sitting on the bottom of the lake are the result of people in the early 1900s choosing to drive in winter across the frozen lake. But they did not always judge how thick the ice was, and went through. Steamboats on the bottom resulted from being burned and sunk as wrecks when they were no longer of use to ferry people around the lake. Since the late 20th century, divers frequently visit these ruins on the bottom as part of their recreation. The Coeur d'Alene Tribe owns the southern third of Lake Coeur d'Alene and its submerged lands as part of its reservation, in addition to miles of the Saint Joe River and its submerged lands, all of which the United States holds in trust for the tribe. Its rights to the lake and river were established in the first executive order founding its reservation, which originally included all of the lake. In United States v. Idaho (2001), the United States Supreme Court held that an 1873 executive order issued by President Ulysses S. Grant formalized ownership by the tribe. While the court holding has not affected usage and access to Lake Coeur d'Alene, the Environmental Protection Agency has ruled that the tribe may set its own water-quality standards on its portion of Lake Coeur d'Alene. Lake Coeur d'Alene is a popular tourist site for many people during the summer, offering great beaches and scenic views. A seasonal hobby of some local residents is viewing the bald eagles as they feed on the kokanee in the lake, mainly from the Wolf Lodge Bay. The North Idaho Centennial Trail, popular among cyclists, walkers, and joggers, follows along the lake's north and northeastern shore. The Trail of the Coeur d'Alenes also runs along the southern shores. For a decade, the lake hosted unlimited hydroplane races for the Diamond Cup (1958–1966, 1968). The song "Coeur d'Alene" by the rock band Alter Bridge from their third album AB III is about this lake. ^ Rees, John E. (1918). Idaho Chronology, Nomenclature, Bibliography. W.B. Conkey Company. p. 65. 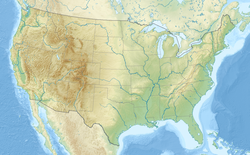 ^ "Post Falls Hydroelectric Development". Avista Utilities. Retrieved 2011-11-29. ^ Boni, Bill (June 30, 1958). "Big Idaho race seen by 30,000". Spokesman-Review. Spokane, Washington. p. 1. ^ "Hydroplane races draw many fans". Spokesman-Review. Spokane, Washington. (editorial). August 14, 1966. p. 4. ^ "Diamond Cup go slated on Aug.11". Spokane Daily Chronicle. Washington. February 15, 1968. p. 25. ^ "Coeur d'Alene announces Diamond Cup cancellation". Spokesman-Review. Spokane, Washington. April 29, 1969. p. 10. ^ Johnson, Bob (February 12, 1972). "Diamond Cup race may be revived". Spokane Daily Chronicle. Washington. p. 10. Wikimedia Commons has media related to Lake Coeur d'Alene. Current Lake Coeur d'Alene water temperature, elevation, and weather conditions. This page was last edited on 8 April 2019, at 16:04 (UTC).